Magneto did what to my paperclip collection!? Oh, whew, here they are. Nevermind, paperclips are okay and accounted for. They are protected by some colorful plastics. 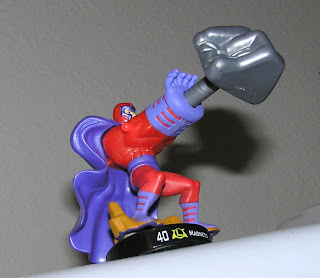 Magneto has a pretty good chunk of metal to throw. His cape looks like a good shield to deflect shots off as well. Thor is on the way via post, meaning I now have all of the booster packs! I can rest until searies 2 comes out. Then I can finish the Fantastic Four and the X-men teams. And then I can close the door on the Toy Museum and start buying leather breif cases and start stamp collecting. 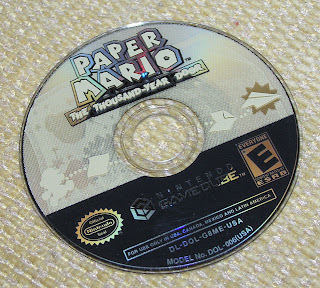 After over 50 plus hours, and many cans of Pepsi, I completed that darn Game Cube game PMtTYD! Whew! I can now sleep at night. Not a very hard game, just one of those time consuming things. I originally bought it in July thinking it was going to be just like the original Mario Brothers games, 2d and jumping on things and collecting coins etc. Turned out it was one of those 'talking' games, with lots of 'talking' and 'puzzels' and 'resting' and 'turns.' Sort of like a Pokemon game or a Final Fantasy game I suppose. The battles had Mario with a hammer on a stage vs his opponents. I was bummed about that at first. Just for the sake of getting my 20$ worth, I played the first level... er chapter. I ended up having more fun than I expected, but still put the game away for a month or so. Then in October or so when things started getting cold outside, I played through chapter 2. Probably my favorite level, had lots of little 'Punni' bird like creatures. They were funny looking and the level was dark and forestry pretty. Anything with large trees amuses me anyways. But I put the game down again, due to its lengthy ways. January came along, it's a very boring dark month indeed, so I once again loaded up the game. Chapter 3 I think it was had an arena setting and involved lots of battles with Mario. Probably the longest level, 20 fights + more to accomplish all the objectives. And after all that work, I figured I better plow through the rest of the game. And so I did. Chapters four, five and six, in the next month, and then finally in March the last few fights. I was really really really lucky on the final battle. I probalby didn't have enought health points yet to even tackle the biggest fights in the end, but due to a few extremly lucky slot machine rolls (recovers your health) I was able to win with only 2 out of 70 life points. Of course some good old fashioned Strategery in battle as well. The ending seemed as long as the ending in Return of the King... It just kept going and going and going. But worth it in the end. I like whole the main villian can't make a come back because he is 'just a head' now thing. The only thing I didn't accomplish yet is getting to the bottom of the pipe hole challenge thingy under Rougeport. I got to level 70 out of 100. It takes about 2 hours of battling to get to 70, so I escaped back up the the top to reheal. I should load up, and see what the heck is at the bottom. But that's probably three hours of fun. Maybe on a back on the wagon day. Other than that, I am now free to be normal again. Yeeeeeaaaaaah. 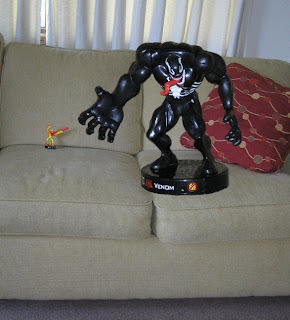 Venom Attacktix is simply Huge! 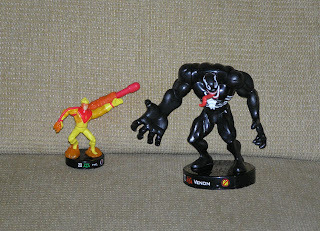 I am amazed at how tall Venom is in the Attacktix universe. He stands almost twice as tall as his fellow opponents. Okay-Okay. I exagerated a bit. He actually stands 50 times as large! I didn't want to scare people off from purchasing there own. Okay-okay. I over exagerated again. He actually stands at 200 times as large! 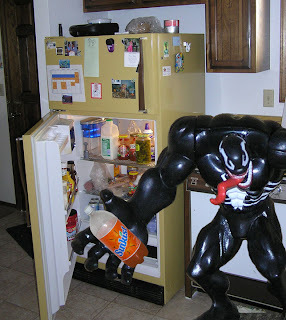 But I didn't want to alarm anyone, that Venom raids your refrigerator for Sunkist. He really makes a mess of the place as well. 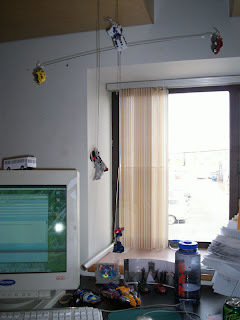 It's a good thing to build a Transformers Mobile above your desk. I recommend the key chain versions because of the little loops they have to anchor into the wires. I am getting real close to collecting all the booster packs of series one Marvel Attacktix. Do I win a prize? I have yet to really test these guys in battle, but I like the weakest warrior class spidey the best. He has a very strong/long striker arm (I also lucked out and have a chrome version as well). Spider-man on the pole has a difficult kick, and possible dooming tilt, but special attack power that might come in handy ('Teamwork' -extra attack if four different marvel classes in play). 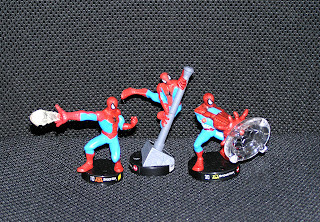 Web attack Spidy has the biggest base, so he might be tough to knock over. 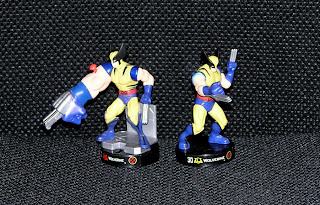 The booster Wolverine is way better than then starter pack version. He has a mean claw attack arm that springs out claws over a full half inch at maximum strength and speed!!! I would imagine any opponent he gets right next to, will go down from the claw attack (as long as you don't hit the Thing from his side), however his weakness will be getting to his target in time. Captain America has been aquired, but is shy to a picture, since he has been abducted several times by the "family dog." Venom and Magneto are on their way via post. And Thor has yet to be Ebayed. Everyone laughs at my obsession for collecting these Attacktix, but someday some kid (probably me) will pop an eye out from a powerfull missfired projectile, an angry Mom will cry foul, and these will all be recalled, thus making the worth of my collection One Million Dollars! Bwa-Ha-ha! 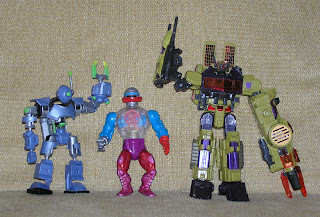 It's the Robots with one eye club! I think one eye works best on a Robot. I Want a Sky Lynx! My new goal in life is to some day own a Sky Lynx. But darn, they are spendy on Ebay going for 200 to 500 bucks. Maybe I will slowly buy parts of one. Or maybe one of my visitors will help me find a 'free' or 'cheap' one. FYI, My birthday is at the end of March. 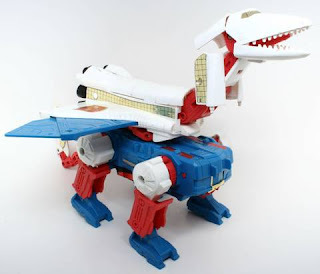 For now, I will leave this under a label, and perhaps every now and again I will whine about wanting a Sky Lynx. I can't believe I actually snagged a Hulk! This is like the Yoda from Star Wars series 1 that I never got. And to top it off, the very next pack I opened had ANOTHER Hulk in it. Now I have two Hulks, Bwa-ha-ha. The down side is he's a horrible thrower. Well, not too horrible, it will just take some practice. In theory he should be as powerfull as old Chief Chirpa. I need to exacto better holes in his radioactive barrel so it doesn't stick so bad. He does have a wide base, good for staying up. I also got a common figure Electra. It seems like they ran out of silver paint for her weapons though. They sparkle in certain lights, and in other lights it looks like she has strange hands. I wonder if it is a flaw or are they all like that? Back to Hulk. 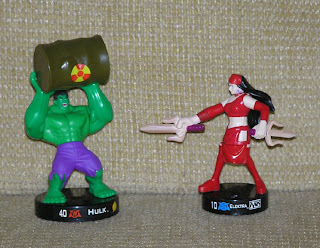 The other down side is, that Hulk should be a super Mega figure. I would also like to see a big Sentinel and or Apocolpse. Instead they made a lame Spiderman on a pole, like we haven't seen that before. I have mixed feelings for the upcoming Colossus throwing Wolverine, its cool, but eh? And eh to the big Sandman guy as well. I WANT A SENTINEL!